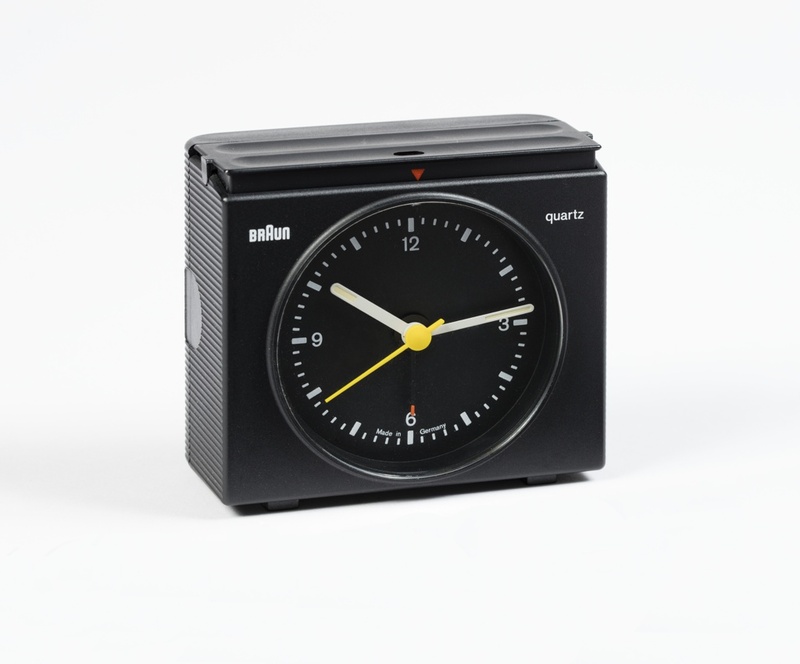 Dieter Rams, the co-designer of this alarm clock, said that good design should “omit the unimportant in order to emphasize the important.” This travel alarm clock embodies his philosophy and design aesthetic—one which became iconic for Braun in the 1970s. The clock features an economic use of color and Akzidenz Grotesk, an easy-to-read sans serif font that was an antecedent to the popular Helvetica font. Dietrich Lubs, the other designer of this clock who initially worked in Braun’s Appliance Typography department, is partially responsible for creating a meticulous brand identity for Braun’s line of alarm clocks. He believed that the most attractive position of the clock was with its hands set at 10:08, and, as such, this is how Braun photographed them. Also, all of Braun’s alarm clocks featured the same alarm sound and a yellow secondhand. The simple, clean design of this travel alarm clock should not be mistaken for a simple design process, though. Rams and Lubs strategically considered the users’ environment and interactions with the product; this research-driven approach informed their design choices. For example, the ridged side allows the user to feel his or her way up the alarm and to switch the alarm off–even in the dark and in a groggy state. The color-coded hands of the clock are easily visible in the dark, as well. The design principles at work here, which favor function over superfluous ornamentation, remain popular in industrial and product design today. Apple, a brand frequently noted for its restrained and sophisticated use of color and line, borrowed the face design of this and similar Braun clocks for their clock app on iOS 7 in 2013. This alarm clock as well as other products designed by Dieter Rams and his team of industrial designers at Braun can be seen in Bob Greenberg Selects, on view in the Nancy and Edwin Marks Collection Gallery through September 9th, 2018.